Utah is recognized for having the longest and most diverse dinosaur record in the nation. Yet, the Cambrian rocks in Utah’s West Desert contain one of our nation’s best records of the early evolution of life on Earth. 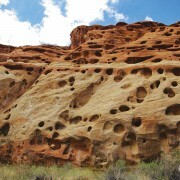 View a slideshow of rocks and fossils from the West Desert here. During the Cambrian Period, North America straddled the Equator and the continent was oriented nearly 90 degrees clockwise of its present position. The Cambrian coastline extended north-south across Utah shifting southward (our east) with rising sea level. This resulted in a nearly complete sequence of Cambrian rocks preserved in Utah’s West Desert on what was the northern coastline of early North America. When Tertiary extension forces formed the Basin and Range Geological Province throughout the last 20 million years, these Cambrian rocks became well-exposed across western and central Utah, revealing the extraordinary fossil record within. Nowhere is this geology better exposed than in Millard County, Utah. Refer to Hintze and Davis (2003) (17 MB PDF) for a detailed discussion of the county’s geology. The Cambrian is best known for the “Cambrian Explosion” (or “Cambrian Radiation”) , when a great diversity of multicellular animals first appears. The first scientific report on these fossils was a description of Elrathia kingii in 1860, probably the world’s most well-known trilobite species.